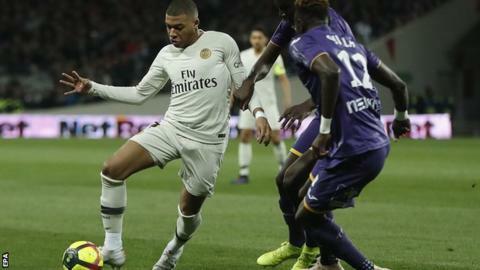 Kylian Mbappe scored his 31st goal of the season as Ligue 1 leaders Paris St-Germain edged to victory at Toulouse. Thomas Tuchel's side are running away with the title and maintained their 20-point cushion after second-placed Lille came from 2-0 down to beat Nantes 3-2. The visitors thought they had gone ahead but the video assistant referee (VAR) ruled out a Marquinhos goal. Mbappe's well-taken touch and first-time finish settled the contest with 16 minutes remaining. Attempt blocked. Juan Bernat (Paris Saint Germain) left footed shot from the centre of the box is blocked. Assisted by Kylian Mbappé. Marquinhos (Paris Saint Germain) wins a free kick in the attacking half. Attempt blocked. Yaya Sanogo (Toulouse) header from the centre of the box is blocked. Assisted by Issiaga Sylla with a cross.